Are you looking for a quick, no-prep ESL warm-up activity that’ll work for both kids as well as adults? Then you’re in the right place. Keep on reading to learn more about Would you Rather? and how you can use it in your classes. Would You Rather? is a fun ESL warm-up activity. You can buy ready-made decks, but they aren’t ESL specific. I use self-made cards, which takes a bit of time buy then you can recycle them from class to class. Another options is to just make a list of questions. If you’re quick on your feet, you can do this without materials. 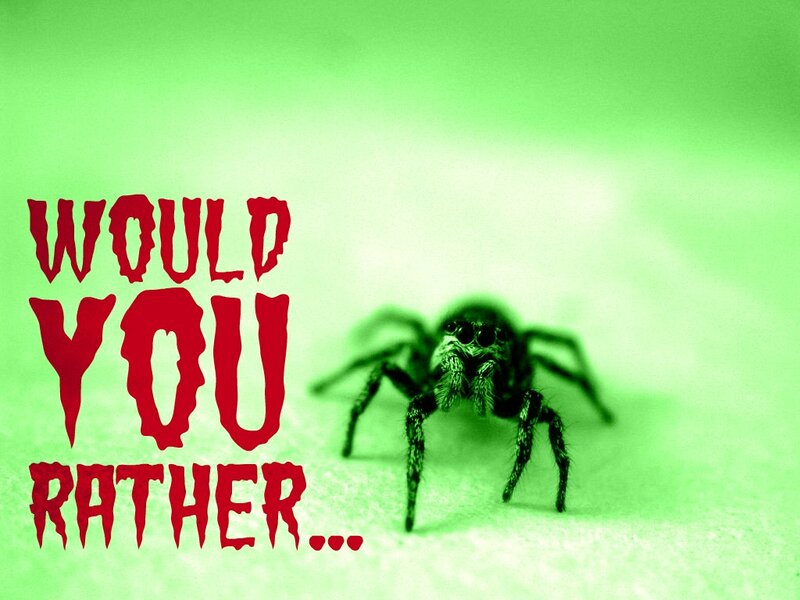 For example, “Would you rather have eyes like a fly’s, or eyes like a spider’s?” Students must choose one and explain why. If you class is small, you can do this as a single group. Each student can answer the question, and you can too! If the class is a bit larger, I prefer to work in small groups of 3-4, giving each group part of the deck of cards. This helps make your class more student-centred and increases student talking time. If you want to work in groups, but haven’t prepared questions in advance, state two choices and give each group 1-2 minutes to discuss amongst themselves. Procedure for Would you Rather? In advance, prepare cards with two choices, the odder, the better. For example, “Would you rather have eyes like a fly’s, or eyes like a spider’s?” If you want to do this without cards, simply give students two choices and 1-2 minutes to discuss. Divide students into groups of 3-4 and give each group an equal portion of the deck of question cards. Have students take turns choosing a card to ask their group, or read aloud and give their own answer. If you liked this ESL warm-up activity, then you’ll need to check out this book: 39 ESL Warm-Ups: For Teenagers and Adults. There are enough fun, engaging and interesting ESL warm-ups to start off every one of your classes in style. Chances are your students haven’t spoken a word of English since your last class. If this is your situation, then you’ll need to do your best to ease students into it. I find that going directly into the lesson is less than ideal! It’s best to start with something light and fun, but in English. Once everyone is warm, dive into your main lesson for the day. If this sounds awesome and you’re looking for fresh new ideas for ESL warm-ups, check out the book on Amazon. It’s available in both digital and print formats. Keep a copy on the bookshelf at your office at work as a handy reference tool. Or, take a copy on your phone or tablet to your favourite coffee shop when you’re planning your lessons. Buy 39 ESL Warm-Ups for Teenagers and Adults today. But, only if you want to get your classes started off on the right foot. What are your thoughts about this easy ESL warm-up activity? Leave a comment below and let us know what you think. esl activity, esl activity adults, esl activity kids, esl speaking, esl speaking adults, esl speaking children, esl speaking kids, esl warm up, esl warm up adults, esl warmup, warm up activity, warm-up.